"Long in the Tooth" is a familiar expression but will it happen to all of us? Good news! The answer is No. With proper attention and oral care you can avoid gum recession and your gums can stay healthy and close to the same height throughout your life! Our team of Lorne Park Dental hygienists want to help you keep your gums high. Gum Recession is a change in the height of the gum tissue, known as the gingiva, at the neck of a tooth. When the gums pull back, the root surface of the tooth is exposed. The roots of the teeth are naturally a little more yellow or darker in colour. Gum recession causes a tooth to look longer than normal. The softer root surface is not covered by hard enamel like the crowns of our teeth that we see when we smile. Sugars and plaque bacteria (now referred to as oral biofilm) are more likely to cause cavities on this part of a tooth. Seniors, who's mouths are naturally drier, are especially prone to root surface cavities because they don't have as much saliva in their mouths to wash the sugars and plaque bacteria away. The same is true for persons who take certain medications which tend to dry the mouth. Also, exposed roots may be more sensitive to temperature changes, especially cold things, sweets or even the touch of your toothbrush. What causes gum recession and how can it be prevented? 1. Often gum recession is caused by brushing too hard across the gums and teeth with the flat surface of a toothbrush. The sharp ends of these bristles actually cut the gum fibres and wear them away. Generally, it's best to lay a soft toothbrush at a 45 degree angle, on the gums, above the necks of the teeth. A circular motion can be used to remove food debris and bacterial plaque from the gum line and to massage the gums too. Our team of dental professionals at Lorne Park Dental is happy to help customize a brushing method that will work best for you and not cause gum recession. 2. Clenching or grinding the teeth results in strong forces being applied to the teeth which can result in gum recession. Uneven biting forces occur when person's teeth don't mesh properly. This can cause gum recession too. At Lorne Park Dental we are here to help you manage any habits that may affect your teeth and gum level and when necessary, to suggest ways to even your bite. 3. From time to time we see cases of "accidental" gum recession. It's best to keep things like pens, pencils, tools or sharp items out of your mouth. 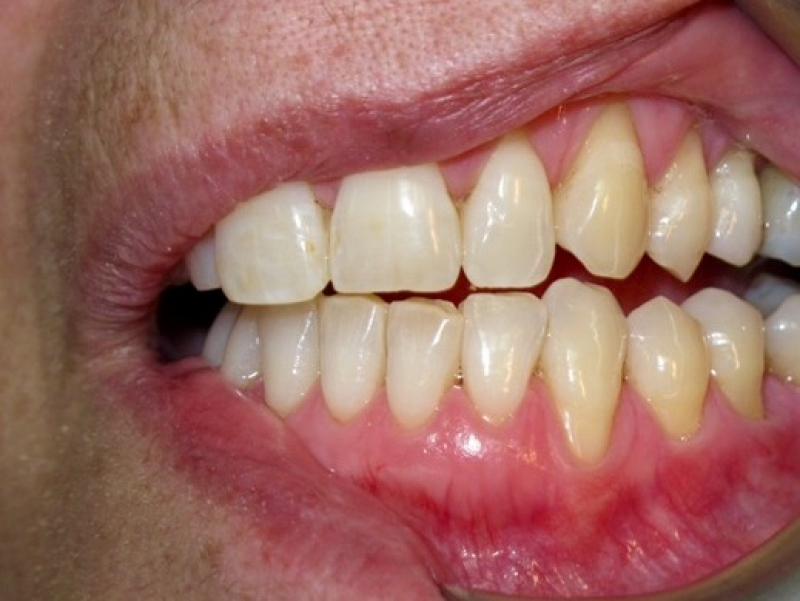 Slippage can cause injury to the gums and result in gum recession. 4. A tiny ligament that connects the inner lower lip to the gums can sometimes have a pulling effect. This can result in gum recession around a lower front tooth. How do I know how much gum recession I have? Part of our thorough dental exam includes taking and recording measurements of any areas of gum recession. A dental instrument which acts as a ruler is used to take precise measurements in millimetres. We will share our findings with you and monitor any areas of gum recession for change. Will the gums return to their original height? Unfortunately, once the gums recede they will not return to their original height on their own. In some cases a referral to a gum specialist, a periodontist, may be needed for a gum graft procedure. What about those softer root surfaces that show when the gums recede? Many products, such as fluoride toothpastes, varnishes, gels and mouth rinses are available to help harden the roots of the teeth and help protect them from the sugars and plaque bacteria that can cause cavities. There are also many products available to reduce root surface sensitivity, lubricate the mouth and stimulate the salivary flow. We can help suggest products that are right for you. Our Lorne Park Dental team in Mississauga is here to help you keep them that way!